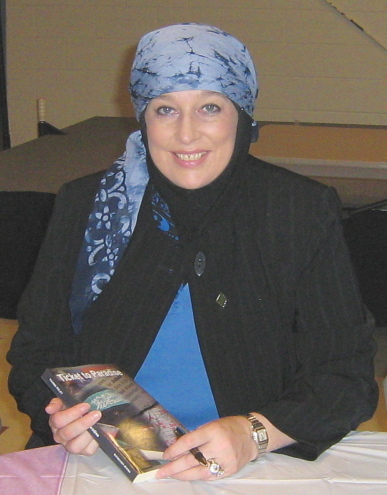 British journalist Yvonne Ridley, who converted to Islam after being captured by the Taliban, tells Asma Hanif that oppression of Muslim women has to do with traditions rather than with Islam and explains why she became a Muslim. It was Yvonne’s camera that betrayed her to the Taliban in September 2001, landing her in an Afghan cell for ten days and starting a long process in her life. In front of a Taliban soldier, it slipped from her shoulder when, disguised as an Afghan woman with a head-to-toe burka, she entered the country without her passport on the brink of the US-led invasion. The Sunday Express reporter wanted to talk to ordinary Afghans and write a human interest feature. But the Taliban suspected Yvonne of being a spy for the Americans at a time when Afghans flew by thousands to secure their lives outside their country’s borders. Yvonne, then 42, replied to them: “If I was to be an American spy, then God help the Americans.” Mullah Omar eventually ordered her release on “humanitarian grounds”. But the camera was never to be returned to her. “I’m sorry, the Taliban confiscated my camera when I was arrested, so I have no picture from that period,” reads her email to me when I asked her if she has a photo of her cell to illustrate this feature. With the fall of the Taliban, the cellmates were exchanged. When Yvonne returned to Afghanistan after her release and visited the cell in the women’s section of a Kabul prison, she was surprised. The first Afghan Minister of women’s affairs to work after the fall of the Taliban, Dr Sima Samar, did not even have her own office, Yvonne realized when she met her in March 2002. “In the end she was hounded out of office,” she says. “Being a woman in Afghanistan is a tough life,” Yvonne concludes. “But it has been for centuries – it has to do with customs and traditions.” Even if women are often subjugated in Muslim societies, Islam stands far from these traditions, claims the Muslim feminist. It was Yvonne’s capture by the Taliban that sparked the process switching her from a wine and cigarette admirer into a devout Muslim who prays five times a day. Rejecting people’s initial rumors which suggested that she suffers from the Stockholm syndrome, Yvonne says she made the step by pure conviction. When initially reading the Quran, Yvonne recalls, she intended to find out “how it teaches men to beat their wives”. But she emerged entranced. “The Quran makes it crystal clear that women are equal to men in spirituality, worth and education,” she realized. Gradually, she began adopting Islamic practices and cutting out un-Islamic customs like alcohol and cigarettes. “I had a battle with cigarettes which I finally won – at last,” she jokes. Yvonne also began covering her head, finding it “liberating not to be judged by the size of her legs”. Although, before her conversion, she recalls looking at veiled women as ‘silent, oppressed creatures’, she now wears her veil as a means to show her Muslim identity, and to be respected as a Muslim who does not want to be offered a glass of wine. Now that she has ‘seen the veil from both sides’, as she describes herself, Yvonne knows what she defends – Islam purely and simply. The grades used – largely by Western media – to measure the levels of Islam such as ‘moderate Muslim’ and ‘Islamist’, are nonsense in her eyes. “What is a moderate and what is an extremist? I really don’t know,” she says. “I am a simple Muslim. I follow no scholars or sects. I merely follow the Prophet Mohammad and the Sunnah (the Arabic word for Prophet Muhammad’s tradition). Does that make me an extremist? Yvonne strongly opposes distortions and manipulations about Islam. She once declined an offer by a Hollywood producer who, after having read her book, In the hands of the Taliban, expressed an interest in making a film, but had misinterpreted the Taliban as “dirty, filthy, stinking Arabs”. It seems that, if not confiscated, Yvonne’s camera would have pictured the Afghans from a different perspective than many others’. But her pen did.